Fear not fellow investors. Despite all 4 indexes hitting new highs this week there shouldn't be a worry abound. Not just because Christmas and all the many other holidays celebrated this month are near. Because a higher market doesn't mean a crash is right around the next corner. I get it. For many the pain and stress of two major free falls, plus plenty of 10% pullbacks, is brandished in their memory. But if you stuck through thick and thin since January 2000 you'd still be up 124% according to the S&P 500 Total Return Index which includes dividends. A gain is a gain, you can't argue with that. Would your gain have been bigger if you correctly sold the tops, and bought the bottoms in the chart? Of course! Yet we all know most of us are horrible at doing that. Warren Buffet's approach is buy for the long term. Amass a ton of cash during up trends. Wait patiently for a pull back, and dive in head first. Of course all along the way he cuts positions that no longer makes sense, or adds to existing ones turn into even better ideas. It's an approach I try to follow myself. No matter what your theory or approach is, the biggest mistake most people make is not even being involved in the market. For the regular person with no training in the markets buy and hold is the best strategy. It's simple for one. Two it at least gives you some skin in the game, and a chance to amass wealth. This rally is certainly one that feels like it won't stop going up. No doubt there will be down days. Just look at that chart. Do you see a straight line up? Didn't think so. The only issue I see right now is in the bond market. I highlighted in yesterdays post the big move we've seen with US Treasury prices. With yields coming off literally zero in most places in the world the only place to look is up. This is likely going to go down as one of the biggest bubble popping's in history. Yet I hear few people talking about it. I only keep hearing talk about the stock market going to crash. If you do own bonds it seems like it'd be a good idea to review your holdings, and maybe talk with a good advisor if you're unsure of what to do. I'm going to get straight to the portfolio this week as economic reports were light this week and not a whole lot has changed recently besides big moves up in consumer confidence. 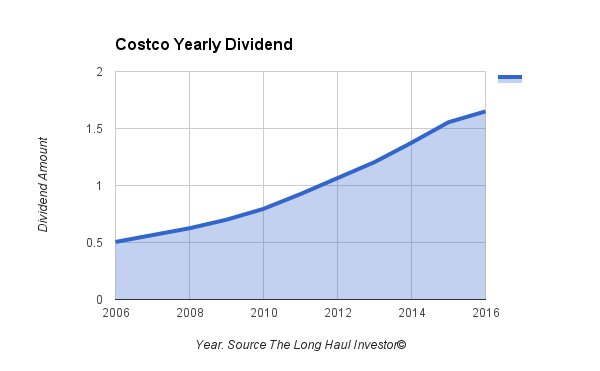 Costco(COST) reported a solid start to it's fiscal year with Q1 EPS coming in at $1.24 on revenue of $28 billion. Same store sales excluding the effects of gasoline and currency fluctuation were up 2% for the entire company. Additionally this quarter the company paid out a dividend of $0.45/share, which is up from the previous $0.40/share. That's a 12.5% increase, and that matches their 10 year growth rate of 12.5% according to my calculations. This company is looking to be a steady dividend machine. The stock has been frustrating though. It seems to get a nice bounce after each earnings report, only to find itself drifting lower after. I do think the stock will finally start to gain some traction in 2017. I think the next quarter will have some dings in it from Amazon competition no doubt. Though I can see the company continuing to find ways to grow and earn more, even if the pace is slower. Plus saving money is always in style. Speaking of dividends MasterCard(MA) also boosted their payout this week by 15.8% and announced a $4 billion share repurchase program. That's on top of last years 19% raise. The company looks to keep raising it's dividend by double digit amounts for the time being. While the stock is trailing the index so far it is still up 7.2% for the year(excluding dividends). I'm expecting 2017 to be a much better year for all the payment processors. Reynolds American(RAI) had some rumors swirling around that British American Tobacco(BTI) was going to increase it's offer price. I'm not so sure about that. I mean I could see it especially with the British Pound still under pressure. That would follow the steps of AB Inbev(BUD) and SAB Miller's acquisition. But I don't think the increase will be much. Maybe a couple percentage points overall, or just an increase in the cash portion. Either way the more important aspect in this industry right now is how well the vaping and e-cig market will expand. There are already steps being taken by government officials worldwide to curb it's use so keep an eye out as that will impact profits. I get the products can be harmful, but that hasn't stopped the government from allowing diabetes inducing soda, and lethal prescription drugs from entering the market.